We pride ourselves on delighting our customers. Read what they have to say about us. Want to add your comments? Contact us to submit your own testimonial or post your comments or read more from our Customers on our Facebook Page. I just received the candy. They look beautiful!!! Hopefully people at the party will ask where I got these so you can sell more. It was great luck that I ran into you @ Bloomies. I'll let you know what the response is after the party...The candy was a huge hit. Thank you so much for everything. They were perfect. It was a pleasure working with you. Thank you. They are beautiful and so delicious! They arrived yesterday. They look great. Thanks so much. It was a pleasure dealing with you. The party was a big success and the flowers were a hit. I loved everything. Thank you very much. It was really a pleasure to work with you – you were very prompt and accommodating. The bomboniere were beautiful. I just can't thank you enough. With many thanks and appreciation for your service. We opened a box and they are delicious. The flowers were spectacular…people are still talking about them. Just the perfect addition to a beautiful wedding. Can’t thank you enough for all your help and your patience as we muddled through. It was a pleasure working with you! It was perfect! Thank you very much. Thank you for all the effort you put into getting my flowers for me on time. That means a lot to me. I certainly will order from you again. Thank you so much for all your help and for the rush order. I truly appreciate it. Thank you for the candies – they are delicious! Thanks sooooooo much. The candies are great and I appreciate the bigliettino very much. You have a great product. I will definitely remember you and recommend you to all the Greeks here in Dallas. -- Tassi, Dallas TX, January 2006. Jamie, everything was perfect. The ribbons were exactly the way I pictured them and the icons are stunning. My cousin also saw them and asked where I ordered them from so I showed her your website she was amazed with all the pieces you had. She says they are all very european and she is definitely going to order from you for her next event. Once again thank you so much for all your help and I will speak to you hopefully soon! Good luck with business, your work is truly amazing! I received the bags and they are beautiful, really gorgeous ! The size is perfect , the flowers are incredible pretty, like peach and cherry blossoms .Very delicate. They will be greatly admired ! The bombonieri are BEAUTIFUL!!! My daughters’ First Communion was Sunday, April 30th, and what a terrific day. Our family was so impressed with the favors. Thank you so much for your suggestions, for your hard work, your prompt attention, your business. 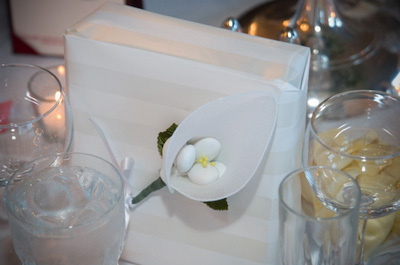 The favors were definitely a hit and I will be sure to keep you in mind for future events. Thanks again. Everything arrived beautifully. The 1st Communion was a huge success and we got a lot of compliments on the favors. Thanks for everything! I had such a great experience working with you and would recommend everyone order from you. Take care. And again, many thanks! These are just absolutely beautiful. Thank you so much for all your help. I am so pleased with the packaging and the variety of fabrics in the little dresses. They are precious! Thank you! They ARE adorable, Jamie!!!! I am thrilled to pieces. Beautiful work, just lovely. Jamie, thank you so much my sunflower arrangement is spectacular and the grapes are just perfect to hang from our gift bottles. Your service was great and your product is well worth the money. Cannot tell you how much we loved everything from your ompany. I got my order and they are lovely. Again I thank you and what a lovely product. You will hear from me again. The baby is due in September and I will let you know if it is a boy or girl.